Many industries that are rail-served have loading docks (others have doorways opening directly onto trackside). In model form, these may be supplied as part of a kit structure, or have to be constructed for scratch-built structures. They are usually not complex to build. I have mentioned the basic process in my column for Model Railroad Hobbyist for March 2014, which described building a bulk oil dealer; like all issues of MRH, it can be downloaded free at their website. (For this particular issue, go to: http://model-railroad-hobbyist.com/magazine/mrh-2014-03-mar .) That loading dock was simply a styrene box, which is like the approach I want to show now. 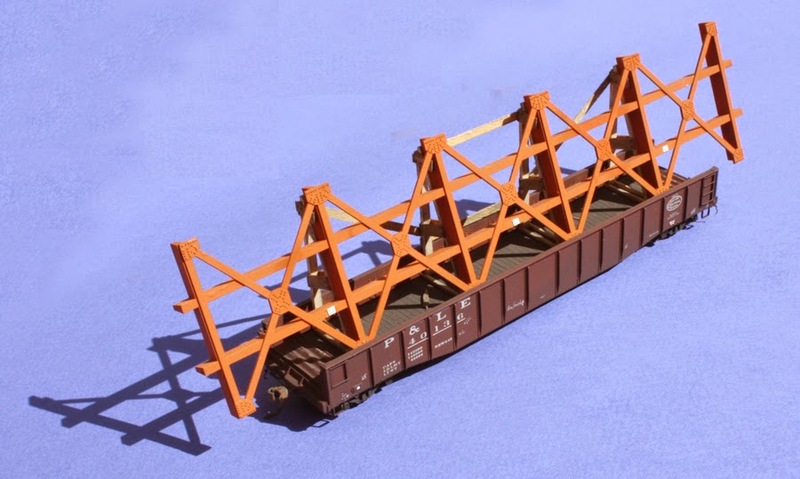 In this post I show the assembly of two such freight docks, one quite simple and the other a little more involved. They do follow the “styrene box” method I’ve used before, not only for my Associated oil bulk dealer, referred to above, but also for the loading dock for the machine shop behind my roundhouse (see: http://modelingthesp.blogspot.com/2014/02/a-roundhouse-for-shumala-part-5.html ). I like to use scribed styrene for the kind of loading dock built of planks. A material I often choose is Evergreen sheet styrene No. 4100. This is a V-groove material, 0.040 inches thick and with 0.100-inch groove spacing. This is about 3 scale inches thick and about 9 inches wide, a realistic size. The V-groove is an exaggeration, since the prototype would not be grooved, but it helps provide definition to the planks, and also helps show the wear of such planking, often notable at plank edges. The two large pieces are the dock’s top and incline. The two long strips, and one short one, are the three sides of the top. The two triangular pieces are sides of the incline, and are arranged as they were cut: first a rectangle, then a diagonal cut to make the two triangles. With this looking all right, I used the same 6 x 10 strips in the corners, to attach the assembled sides to the top of the dock. It isn’t obvious here, but I have also notched the front edge of the top sheet, so the plank divisions are visible on the side of the deck top. I also scrubbed the top with coarse garnet paper and dug a few divots with a hobby knife, to befit a dock with some usage. The same was done to the incline. Next, the incline and its sides are assembled the same way as the rest of the dock, and the two sections are joined. I used a piece of 0.020-inch styrene sheet, pre-bent to the angle between the two sections, to splice the connection underneath. With a couple of trim boards added, here is the complete dock. I painted the dock with Star Brand paint, their color STR-11, “Seasoned Brown Wood,” and weathered it with tube acrylics; see the Reference Pages at upper right of this blog site. Here you see it in front of the state highway garage. My second dock is for the depot at Ballard, so it must fit around the end of the house track, against the depot building, and allow space alongside it for truck traffic to the team track spot. It is L-shaped. I measured all these dimensions carefully on the layout, laid them out on the same kind of V-grooved styrene sheet as for the dock shown above, and then began to assemble it. The same kind of styrene box was built. To make all planks run across the short direction of the platform, I had to splice the top deck in a couple of places, then abraded and distressed the deck as described above. Once all parts were in final size and shape, I airbrushed the sides with SP’s depot color, Colonial Yellow (using Tru-Color paint no. 153), and the top with the same Star Brand wood color mentioned above, and the same weathering. Trim boards are SP’s Light Brown, painted with Tru-Color no. 163. Here it is shown in place against the end of the Ballard depot, with some freight items on it. The depot at right has now been painted Colonial Yellow, as was the plan, described in a prior post about the Ballard depot (which you can see at: http://modelingthesp.blogspot.com/2014/07/my-ballard-depot.html ). The sides of the new dock need a little weathering. And by the way, those are Preiser pallets on the dock. As I said at the outset of this post, many structures, even some kits, need to have loading docks added for rail service. 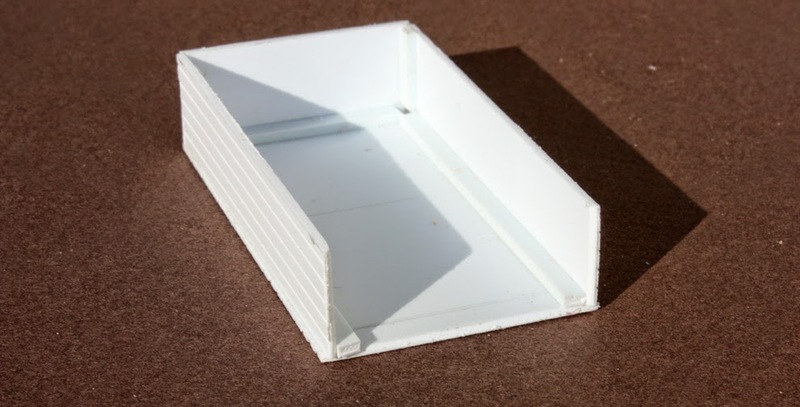 This “styrene box” method is an easy way to make them. In Part 1 (see: http://modelingthesp.blogspot.com/2015/03/an-sp-depot-for-santa-rosalia.html ), I described the background and starting point of constructing an American Model Builders (AMB) laser-cut wood kit, their kit no. 134, for an SP CS 22 depot. In that post, I showed some of the prepainted wall parts. Once walls are done, door and window inserts are added, then begins the installation of windows. This is a somewhat tedious part of the job, though it results in superb window treatments, and because the parts are assembled with peel-and-stick parts, does go quickly. 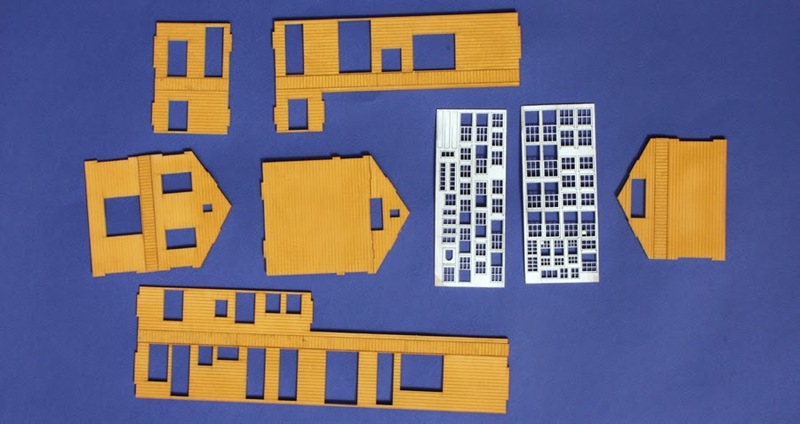 However, if you have a kit issued some time ago, be careful of the drawings in the kit directions, in identifying individual windows and the matching glazing pieces. The original kits, issued in 1996 and thereafter, had some errors in the directions. More recent kits (since around ten years ago) have corrected directions. Here is what to watch for with older kits. The directions show, for example, an E19 window, and the parts layout shows that too, but the corresponding G19 glazing is mis-identified; the two glazing pieces for the two E19 windows are labeled G20 in the glazing layout. And in the layout, what is labeled as G19 is really G15, and G13 is really G20. Similarly, the bay window glazing, parts G3 through G6, are misidentified in the glazing layout, though all pieces of correct size actually are present. You just have to fit the window sashes to each glazing piece to make sure which is which. This slight mixup in the drawings should not be taken as criticism of what really are excellent sash windows. I have rarely seen their equal in any kit. I simply recommend checking each window frame against what is supposed to be its glazing, before trying to assemble any individual window. There are 30-some windows, not counting the sash windows as two parts each, nor counting the glazing in doors. Though assembly of all these pieces can be a little tedious, it is very rewarding because of the excellent appearance of all the windows. With the wall sections all having received their doors and windows, the exterior side of them looked like this (one part of bay window section not shown). The next step is the gluing together of various wall sections into sub-assemblies, then of the sub-assemblies into the full structure. At this point, I might add that I received an interesting question about this kit via email, as to how “accurate” it is. One answer is that it is extremely accurate in representing the standard CS 22 design. The other answer, though, is that most prototype depots of this and other standard SP designs differed in a variety of ways from the “standard” drawing. The freight room portion of each depot was originally built to a length determined by expected traffic, and not only did this differ from place to place, but as events proved the original design to be too large or too small, the freight room end of the depot was often lengthened or shortened accordingly. In addition, many other changes are evident in photos of prototype CS 22 structures. As built, there were no indoor sanitary facilities, with outhouses being provided; over the years, downstairs restrooms, at first for men and in most depots, eventually a women’s room also, were added. A bathroom in the agent’s quarters upstairs was added later in many depots too. And many depots show an extra window or two at various locations. These kinds of changes are evident in photos from Henry Bender’s book, Southern Pacific Lines Standard-Design Depots (Signature Press, 2013). So even though CS 22 was a standard design, many variations existed, and anyone wishing to construct an accurate model of a particular CS 22 will need photographic coverage of the entire building, close to the era to be modeled. In my case, I can build the kit without qualms, since my location is mythical, and a “standard” CS 22 version is just fine for me. Returning to the AMB kit, when I went to glue together the sub-assemblies of walls into a full structure, I discovered the first part of the kit that did not go together perfectly. This was the floor, which had one pair of recesses for wall tabs wrongly located. I simply widened them to the correct location. The change is quite visible, and the slots were enlarged toward the right in this view. The basswood floor was easy to modify this way. At this point, as mentioned, the kit directions suggest connecting pairs of wall units into sub-assemblies, then assembling everything onto the floor. This step is a pleasure, as suddenly you see the entire building emerging into view. Next come the trim boards, already pre-painted light brown, and application of these boards is also a peel-and-stick process, thus should go swiftly. One addition I am considering, is to make a removable second floor and a removable roof over the second-floor part of the depot. If nothing else, this will help with sight lines through the structure, and of course with later additions of interior detail or lighting, if I should want to do that some day. More on this depot later. I introduced this topic with a discussion of model and close-up photography in general, and suggested some good background books on that topic. I also listed my three key requirements for successful model photography: having enough depth of field, enough light, and enough camera stability (see: http://modelingthesp.blogspot.com/2015/02/photographing-railroad-models.html ). I followed up with a second post, addressing more specifically railroad models but still describing the subject in a rather general way (that post is at: http://modelingthesp.blogspot.com/2015/02/photographing-railroad-models-part-2.html ). 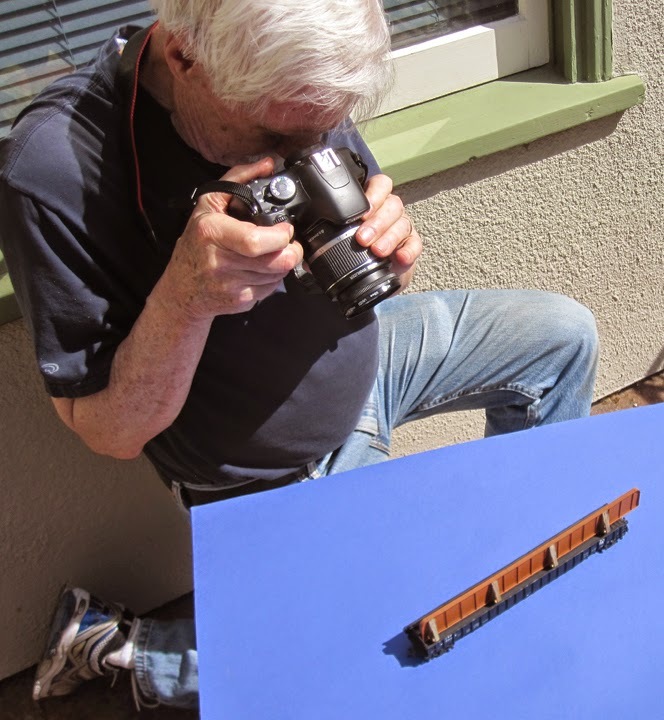 In this post, I will show the simplest and often most convenient way to photograph railroad models. I refer to this as a “table-top” set-up, though there need not be an actual table. In many though not all cases, I do use a small portable table, lightweight, folding for storage, and inexpensive. 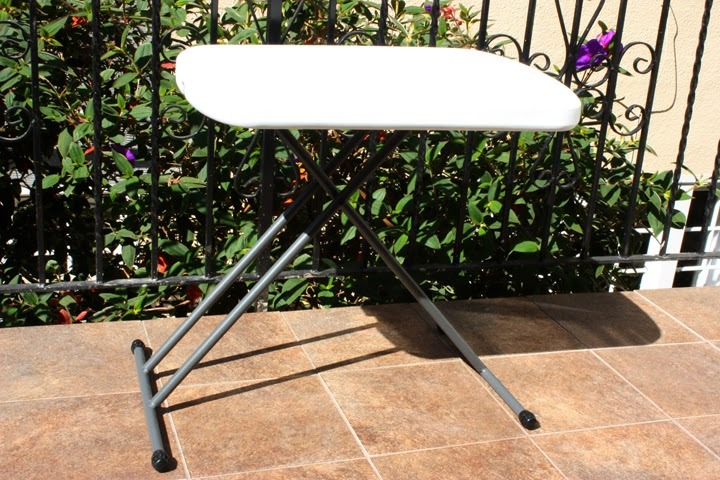 It is a “personal table,” Model 8354, from Lifetime Products; it can be seen here: http://www.lifetime.com/gallery/tableschairs/personal-tables/26-x-18-personal . Tables like this are sold at many big-box stores such as Costco. You can see here the steel legs, and the molded styrofoam (or equivalent) top. The simplest way to make a table-top set-up is to place a white or solid-color background onto the table. 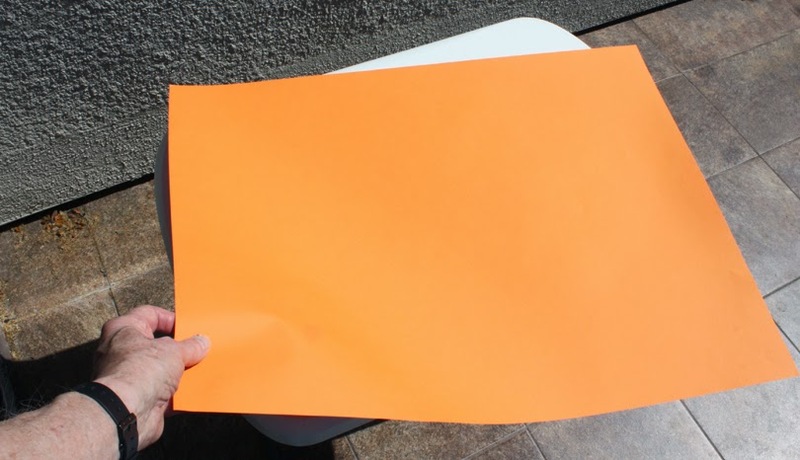 I like the variety of colored papers available at art stores, such as this deep orange, which I’m simply placing on the table top. All that remains is to place the model or other object to be photographed on it. If you do this outdoors, as shown in the preceding photos, ordinary sunlight provides two excellent features: natural light, and plenty of it. In fact, you can usually hand-hold your camera and get satisfactory results. If need be, of course, you can bring a tripod into play, but often won’t need it. 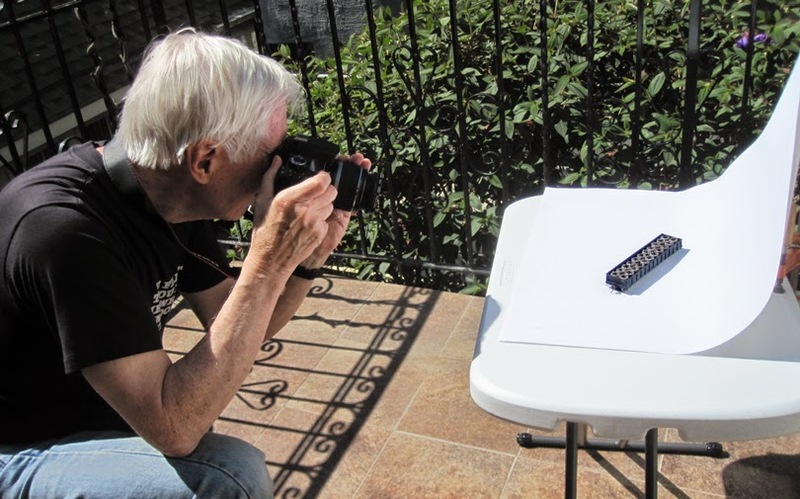 Here I’m using a blue art paper as background to photograph one of the cars among Richard Hendrickson’s open-car loads (described in a previous post at: http://modelingthesp.blogspot.com/2015/03/richard-hendricksons-multi-car-loads.html ). Obviously here I have freedom to move around or above the model to get the perspective I want for the photograph, or to move the model relative to the sun angle for the desired lighting, making this one of the most flexible arrangements you can make. Just to repeat what was mentioned in prior posts, my digital SLR is a Canon model XSi, here with an 18–55 mm zoom lens. I have it set on “aperture priority,” stopped down as far as it will go, which is f / 25. For some purposes, especially if you want a more nearly eye-level view, there is the problem of background. 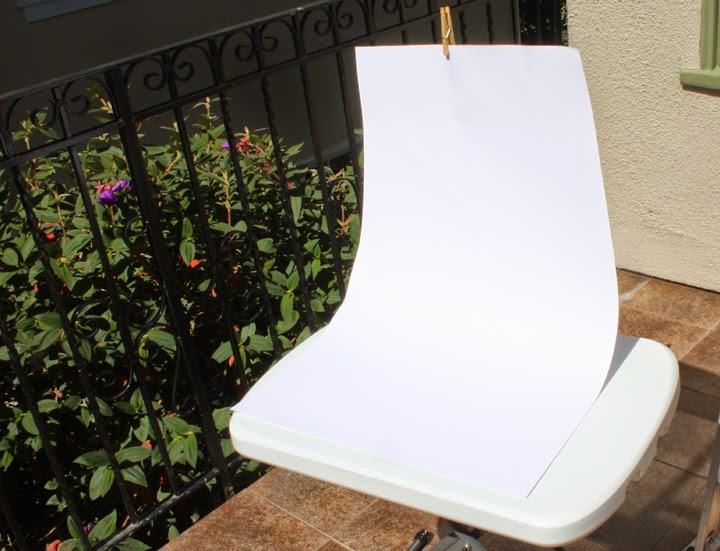 I make a seamless backdrop by the old stand-by, the curved sheet of paper. First, something needs to support the vertical part, for example this bar clamp on my table (many other supports can be arranged). Then a piece of paper, white in this case, or any chosen color in the way I have described earlier in this post, is clipped to the upright (here, attached with a clothes pin). Then one can shoot without worrying about what is behind the model, as you see me doing here. The seamless background set-up can be used indoors too, with the addition of suitable lights and, almost always, a tripod for the camera. I just like the convenience and speed of working in sunlight. By the way, here is the car I’m shooting in the view above, one of Richard Hendrickson’s gondola loads. The one drawback to full sunlight is that shadows can be rather dark. Sometimes you want less contribution from those shadows. One way to take advantage of the plentiful light of daytime but without the strong shadows is simply to photograph outdoors in the shade (or take advantage of a cloudy day). But the light level can be a lot lower, and a tripod may be needed. Still, you get good light balance and no need for artificial light. The table top is a great set-up for many kinds of model photography. Because of the abundant light when it’s done outdoors, the camera needs no tripod when stopped all the way down for depth of field. I will describe more complex photographic issues, including layout photography, in the next post in this series. 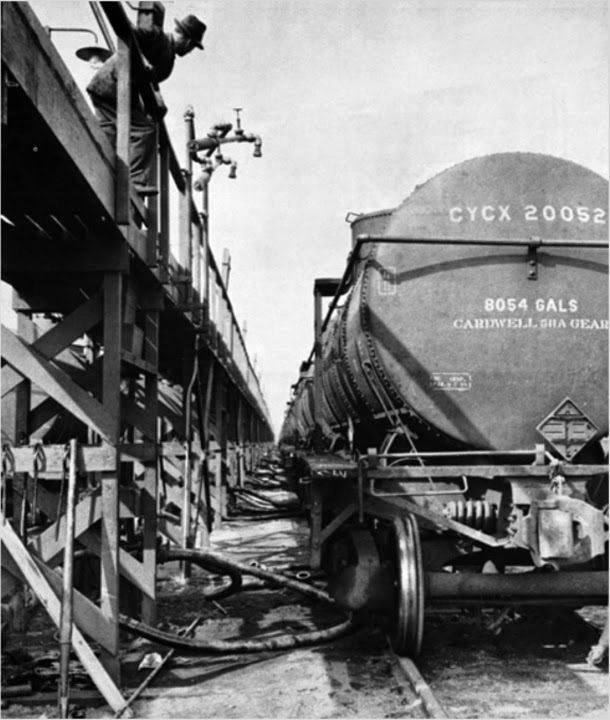 The purpose of this post is to summarize the handling of empty tank cars, nearly all of which were privately owned and in some kind of leased or assigned service. Some of the points I will make in this post have been made before, and whenever that’s the case, I will provide a link to the prior discussion. The primary previous post about empty car billing is Waybills 36, and can be found here: http://modelingthesp.blogspot.com/2014/10/waybills-36-empty-car-waybills.html . 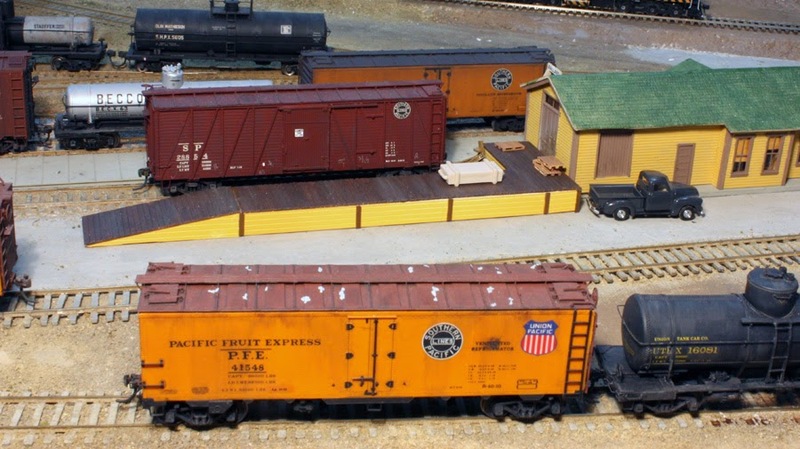 I have also introduced the topic of empty cars, including tank cars, of private ownership, in my post titled Waybills Part 31: http://modelingthesp.blogspot.com/2014/03/waybills-part-31-empty-private-cars.html . When the car is empty, the consignee calls the local agent or car clerk to notify them that the car is empty and ready to be picked up. Here is the process undertaken by such a clerk when notified about an empty private tank car, as clearly explained, in some detail, by Harry Dolan in Waybills Part 29 (at: http://modelingthesp.blogspot.com/2013/06/waybills-29-waybill-preparation.html ). The agent or clerk looked up the inbound waybill to see who owns/leases the car. 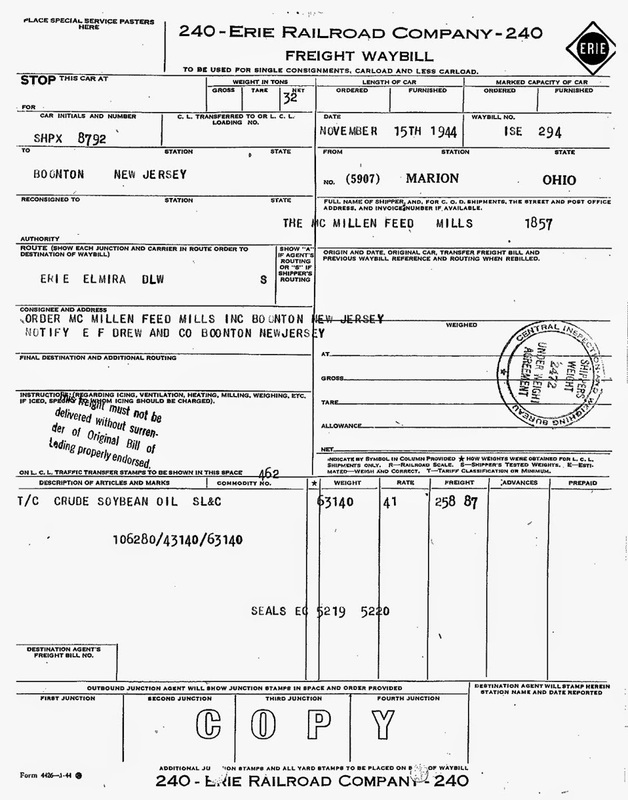 Upon determining the lessor, the clerk then looks to see if there is a file with directions for such cars (such as the Dow Chemical document shown below). On that basis, a waybill for return travel is made out. The acronym “NOIBN” stands for “not otherwise identified by name,” and is visible throughout any tariff document. Whenever a type of product (let’s say, paper) has numerous specialty versions, they must be described by their full name, but if the product being shipped does not fall exactly into any of these specific versions, it is then described by NOIBN, and a kind of averaged tariff is assigned. Usually the private car was returned empty using a regular freight waybill form. This had two benefits: the most important benefit is that the previous cargo had to be identified for safety reasons (see the notation above on the handling instruction document). A second reason was to speed up return of privately-owned cars in assigned or lease service. 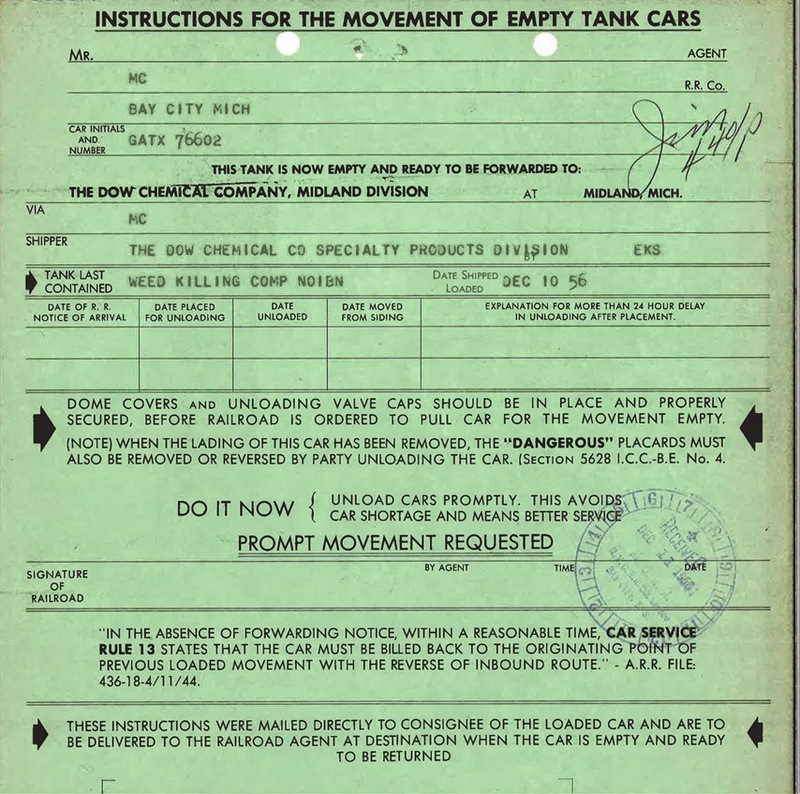 These are some of the particular details associated with empty private cars, especially tank cars, for which return waybills were often used. For more detail, please see some of the prior posts cited above. At the end of my mythical Santa Rosalia Branch, off the SP Coast Line, there is a small town, and it needs a depot. 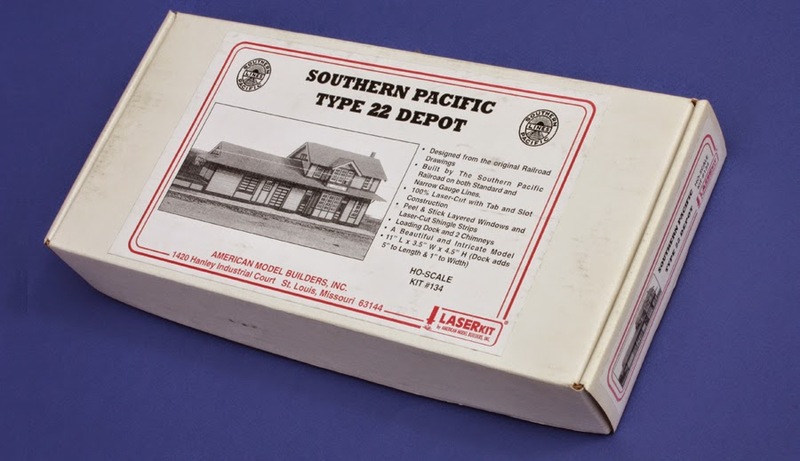 Southern Pacific had 26 numbered designs of standard depots, from small to fairly large, all of frame construction. (These have all been covered in masterful detail by Henry Bender, in his book, Southern Pacific Lines Standard-Design Depots, Signature Press, 2013.) So which would I choose? It might be thought that if Santa Rosalia is not a very big town, it would have a small depot. Actually, this in many cases is backwards. 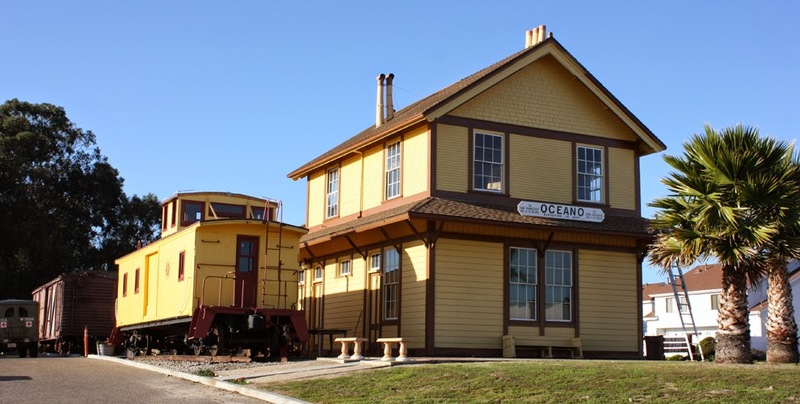 The larger depots had an upstairs living quarter for the agent, and such quarters were only needed in the smaller towns where convenient housing might otherwise not be available. Indeed, SP depots at remote places with no town around them at all, like Surf or Grass Lake, were the two-story designs. So a two-story depot is appropriate for Santa Rosalia. The CS 22 also happens to be a convenient modeling choice, because American Model Builders or AMB has a kit (LaserKit) for this depot, their kit no. 134. (You can visit them at: http://www.laserkit.com/bldgho2.htm .) The history provided in the kit directions predates the Bender book, and is inaccurate in several details, including the dates during which this design of depot was built. In fact, they were built from 1893 until about 1910. But the kit is a marvel of clever design and beautiful parts. Here’s the box. By the way, this is a “right-handed” depot, with the two-story section to the right when viewed from trackside. The SP also built “left-handed” CS 22 depots, and AMB has a kit for that also, their no. 176. I began by separating out the various sheets of laser-cut parts so I could prepaint them in the right depot colors. The kit design by AMB nicely groups common-color parts on separate sheets, so this task is easy. I began with Testor’s White for all the window sash. Then I used Tru-Color’s correct Southern Pacific depot colors for all wall and trim. 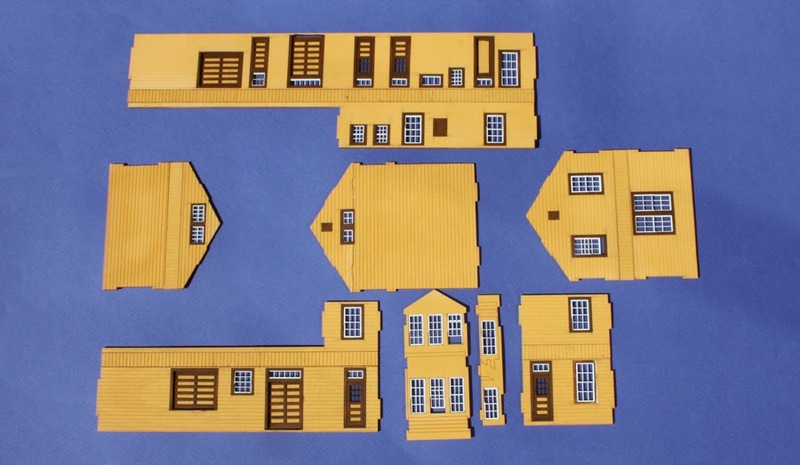 Walls are Colonial Yellow, TCP-153 (note that roof gable trim boards, parts F-11 through F-16, are yellow also), and all other trim is Light Brown (TCP-163, which Tru-Color call “Depot Trim Brown”). This was airbrushed. The first thing you are asked to do in the kit directions is assemble six wall sheets. A total of 22 pieces make up these walls, easily edge-glued with yellow glue and allowed to dry under weight. Here are the assembled wall sections (bay window portion not shown), along with the window sash pieces in white. Once these were complete, I also realized that one can often see inside a structure like this, and ought not to see the raw wood back of the walls, so painted the back of all the wall segments with Star Brand “Sea Foam Green” (STR-08), one of those annoying institutional green colors (SP used it inside diesel locomotive cabs). Many SP buildings had cream-colored interiors, so that would be an option also. The next kit step is to glue all the door and window “inserts” (frames) into the assembled walls. These are Light Brown. There are 29 of them. I only mention the numbers here as a forewarning that though this kit goes together perfectly, and is beautifully thought out, it does have a lot of parts. Patience helps with this one. I will continue the description of my progress on this model in future posts, though only in detail where I diverge from the kit instructions. What’s the title about? I’ll come to that in a moment. First, some background. 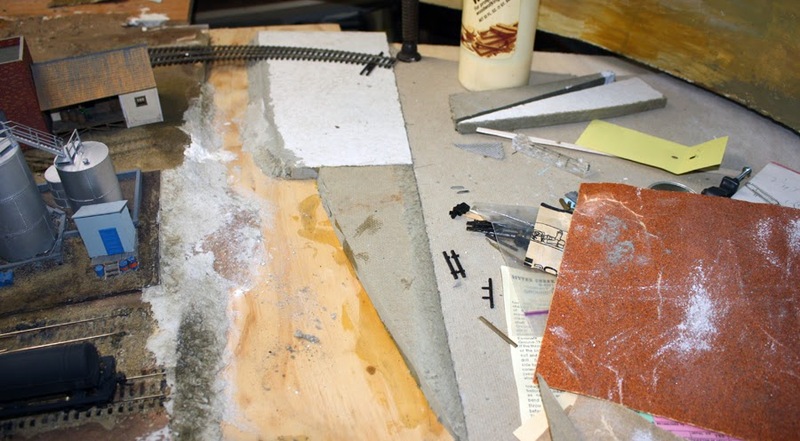 From time to time in the hobby of model railroading, various people feel obliged to “view with alarm” what they believe to be a steadily aging contingent of hobbyists. This is hardly new, and back in the 1940s, when Model Railroader magazine polled its readers every year, an editorial once pointed out that “the average age of hobbyists gets a year older every year.” In those days, each MR survey provided an annual magazine article, a fascinating comparison to today. The obvious conclusion from “a year older every year” for the entire hobby is that the hobby is doomed, and soon. Obviously that didn’t turn out to be true in the 1940s or 50s, because the hobby is still here, and I doubt it is true today, though there are still folks who view the model railroading age distribution with alarm. Why is that view wrong? Well, I certainly don’t have all the answers, but I think a few points can be made. First, it is obvious from the continuing health of model railroading, not just existence but health, that it is far from a dying hobby. That makes it equally obvious that recruitment continues to happen. But my second point is a crucial point. For years, senior hobby people have pushed to publicize the hobby to kids. But as nearly every current model railroader knows, whether or not you liked models as a kid, you became far more serious a lot later. Clubs and other organizations can testify to this: men (and some women) in their later thirties and much of their forties find their child-rearing duties ending, and look for activities that they would enjoy with their new-found leisure time. That’s where recruitment needs to be focused. I have no objection to publicizing model railroading to children (Thomas the Tank Engine already does a bang-up job), I think it’s worthwhile, and as a boy I built a variety of models, gradually turning to just railroad models (more on that in a moment). But high school, college and graduate school intervened, followed by starting a career and helping to raise two sons, and model railroading faded entirely out of my consciousness until my late thirties. As it happened, I first got back into the hobby to build a small layout for my boys, but before long, that led to my getting active again with my own models. I think that the circa-40 age is a critical age, and if I were organizing recruiting to model railroading, I would concentrate there. Many kinds of recruiting can be envisioned, but I just want to mention one (and it’s the reason for the title of this post). As my title for this blog says, whenever you are at any kind of modeling event, say “hi” to the new guy. People come by train events for all kinds of reasons, but some are intrigued with a possible modeling hobby. Walk up to the new guy (or gal) and strike up a conversation. “Are you a modeler? What do you model?” and so on. A welcoming face on the hobby can make all the difference. I learned some of this when I lived in Pittsburgh and belonged to the Pittsburgh Club (then located on the city’s North Side). Like any group, most people on meeting nights gravitated to their friends, and would chat together in groups before the business meeting or the train running. But one member, Andy Lorince, would unfailingly spot the new guy and go over and chat with him. It wasn’t that the rest of us didn’t notice an unfamiliar face, we just didn’t make that little extra effort to say “hi.” Naturally not all the folks Andy spoke to would eventually become club members or even modelers, but quite a few did. I know that some of my age cohorts look around at conventions and notice that practically everyone has gray hair. “Oh no,” they cry, “we’re all getting a year older every year.” But it’s older, especially retired, people who have the leisure time and, often, funds to be able to attend conventions; they really are not anything like a sample of the whole hobby; and don’t forget, each age group tends to socialize with its peers, not with “those kid modelers over there.” Some day, of course, those “kid modelers” will be us. But let me go back for a moment to what can be done with younger people. I had my own experience with this kind of thing. I grew up on the west side of Glendale, California, and after modeling entirely on my own for awhile (except for a few folks I had chatted with at the local hobby shop, the Brass Hat on Pacific Avenue), I saw a newspaper notice about a new-member open house at a club. (Incidentally, I mentioned this hobby shop in a prior post, about a landmark event in my modeling career; you can read it at this link: http://modelingthesp.blogspot.com/2013/07/canadian-reefers-with-overhead-hatches.html .) I went to that open house, and was able to join the club. But there was a little more to the story than that. 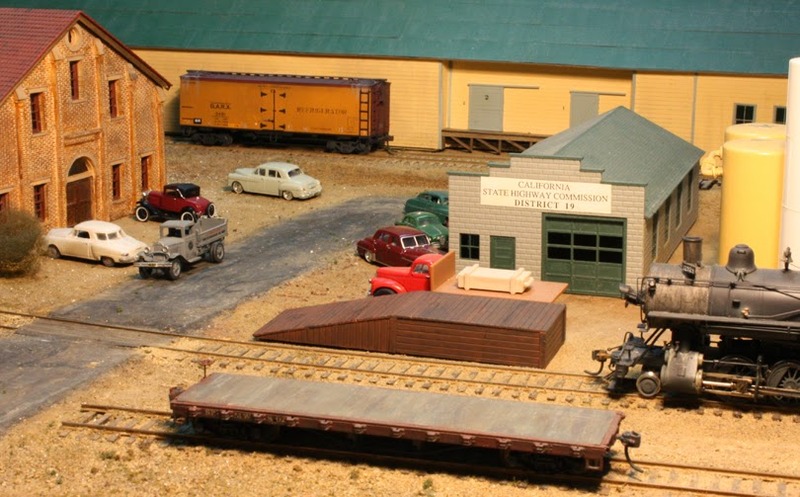 The club was the Glendale Model Railroad Club. Founded in 1949, it was still young when I joined in about 1954. Actually, you had to be an adult to join, but the club had a Junior Member program, allowing teens under 18 to join but restricting them to a separate meeting night (I strongly suspect some of the adult membership was not crazy about the teen program, and didn’t want it in their face at normal meeting nights). This teen program had some interesting features. We were allowed, in fact encouraged, to bring our own models on the Junior meeting night, and run trains. But before you could do that, you were expected to work for an hour on some kind of layout project, usually maintenance, and a senior member would be training you in whatever project it was. I learned to solder feeders, adjust switch machines, repair ground throws, fix sticky couplers and truck swing, and lots of other routine tasks that I had not ever done before. In some ways, that was the foundation of my model railroading skills, and I appreciate it to this day. Partly because of my own pivotal experience in that program for teens, I often ask members of other clubs around the country if they have a Teen Member program of any kind. Most people look at me like I’m crazy, and say something like “heck no.” And when I hold forth about how much I gained from it, I can tell they are not moved to think in such a direction. I’d say that’s too bad. The Glendale club still exists (see: http://www.gmrrc.org/ ), though with a new layout since my day, and they still have Junior Members. I often mention the Glendale Club in acknowledging my own formative years in the hobby. It’s an example of how young prospective modelers can be encouraged and trained. But whatever the age of the person you’re encouraging, here’s the point. A little effort to notice and accept someone who is just checking out a meeting or a show can pay big dividends to the hobby. We should all try it more often. The late Richard Hendrickson was a creative modeler. (I wrote an appreciation of him after his passing last year; you can read that memorial piece at this link: http://modelingthesp.blogspot.com/2014/07/in-memoriam-richard-hendrickson.html .) Among the things I know he greatly enjoyed was the building of open-car loads, always attentive to prototype examples. In this post, I will show a few of the ones he constructed, that required multiple cars to carry them. Some of these cars have gone to new owners, but I photographed almost his entire collection before dispersing much of it to his many friends, so I can show them here. A simple example is a pipe load a little too long for the gondola in which it is loaded. This is no problem with drop-end gondolas, and the solution is to drop one end and use an idler flat car at that end of the load. Here is Richard’s model of that arrangement. The gondola is SP 94033, one of the cars he kitbashed from an Athearn body in his two-part story in Prototype Modeler (in the September-October and November-December issues of 1982, pages 31 and 12). The 40-foot flat car has some dunnage on its deck from some previous load, something Richard modeled on most of his empty flat cars. 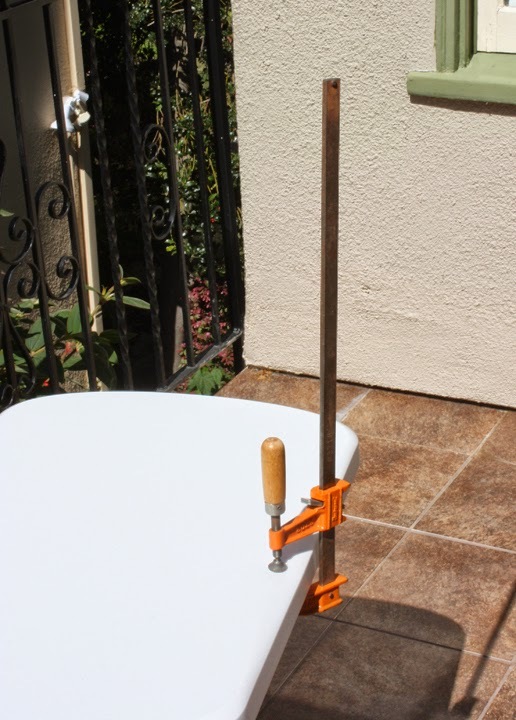 The pipe load is banded with steel strapping, thus the stakes do not have to be tied together over the top of the load, exactly as shown in the AAR Loading Rules book. Another example of a two-car load is this interesting case where the load has to be able to swivel. The flat cars are SSW 81541, a 40-ft. Tichy model, and L&N 24560, an Athearn 50-foot flat car shortened to the prototype’s 47 feet. Both have heavily distressed decks. Again, the arrangement follows the AAR rules. You can click to enlarge. The load does indeed swivel on both cars, and is fixed to the L&N car, as you see below. The pivot is a screw and a nut under the load. The metal socket on the deck of the SSW flat car at right is evident here, as the range of motion. Each swivel point is at the center of its flat car. The bottom of the un-fixed end of the load has a pin, which fits into the socket on the corresponding flat car. Inverted, you can see the arrangement. The two flat cars have coupler knuckles glued together, because with the inflexible distance between the two swivel points for the load, coupler slack can cause problems. But I have operated this pair of cars through tight switches, S-curves, and tunnels, and it operates flawlessly. At one time, Richard had also modeled a two-car load of creosoted poles, using a pair of 40-foot flat cars, and a swivel arrangement similar to the pipe load above. I think it must have been among the 35 or so models Richard had stolen from his rental car in Philadelphia in 1990. Here is a similar load, just using one car, on a WestRail 53-foot flat car, UP 57255. It carries a “Do Not Hump” placard. The tour de force of Richard’s multi-car loads, though, has to be this complete bridge span, with both girders and the deck framing. Idler flats are required between each load-carrying car, and the center gondola has both drop ends lowered. Here the cars are, from left, Precision Scale brass 65-foot gondola NYC 726034, 40-foot flat car W&LE 1974, Proto2000 52-foot gondola P&LE 40136, 40-foot flat car NYC 496240, and another Precision Scale brass 65-foot gondola, CRP 89065. Since the cars are coupled normally, without any swivels, there is no problem with operation of this consist through the tightest curves, but the sheer height of the center frame would limit its operation on some layouts. The height of the frame reaches exactly to the top of the NMRA clearance gauge. Both of the flat cars here are originally Athearn, but have reworked decks, all stake pockets replaced with Tichy parts, and new vertical staff handbrakes. Here is a perspective view just of the car with the high frame, the load aligned so the highest point is at the center of the car width. This car also has a “Do Not Hump” placard. I will later present more of Richard’s excellent open-car loads, but these multi-car loads are very striking, and should give any modeler ideas. In my first post about this creek, I described its location and history (you can read it at: http://modelingthesp.blogspot.com/2015/01/modeling-oso-flaco-creek.html ), and showed my very earliest work to develop a creek bed and banks. Now I want to take up the refinement of this creek bed. My first step, moving forward from the view shown in the previous post (just cited), was to make the banks wider and gentler. I also glued down the Homasote on the right side of this photo, and began development of its bank sides. You can see the location where the trestle over the creek will be, in the background where a piece of track lies across the creek. I had just finished sanding the roughness of previous paper mache layers, thus the sheet of garnet paper at right. Next I wanted to get a little bit of a meander to the path of the creek, which in turn means steepening the banks a little on the outside of the curve, where the creek cuts into the bank at higher water, and flattening the bank on the inside of the curve, where slower water drops its sediment load and makes a gentle slope. That would be easily accomplished in adding more bank shapes beyond what is shown in the photo above, as you see next. I also want to attempt to build an island in the wider section nearest the aisle. Once the fascia here is installed, it will define the contour of the creek banks at the layout edge. 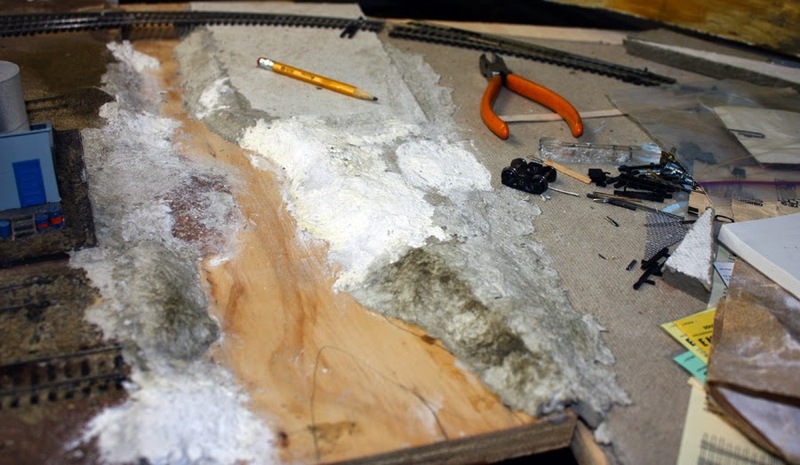 I installed the fascia (see my description of that task, which is at this link: http://modelingthesp.blogspot.com/2015/02/layout-fascia-additions.html ), so then I could finish contouring the creek banks at the layout edge, add the island, and paint everything “dirt” color (I use Rust-Oleum’s acrylic color “Nutmeg”). Though the creek bottom remains without topography, you can see below the basic creek shape which has evolved. Note that beyond the trestle site, no contour is yet created. The intention is to bend the creek to the right, toward the backdrop, so it can disappear gracefully. I added a few more pieces of Homasote at the center rear of the photo above (just left of where you can see the dark area at the base of the backdrop). This brought that area up to level. I then carved in a representation of a “disappearing” creek as it heads for the backdrop. The contours need refinement, but it’s clear what is being done here: to curve the creek so it can fade toward the backdrop. In the foreground is the alignment of track crossing the creek, which I will bridge with a trestle (more on that later). The next problem is the plain plywood bottom. There should be a little topography to the creek bed, and I decided to begin with a coat of shellac. This seals the wood and avoids any problem with a subsequent thin layer of water-based materials, like paper mache, raising the grain. Now I am almost ready to scenic the creek. One of the switching locations planned for my layout extension to East Shumala (see map at: http://modelingthesp.blogspot.com/2014/10/my-column-on-timetable-construction.html ) is a stock pen. As late as the 1950s, many local stock pens were owned and operated by railroads, and SP was no exception. 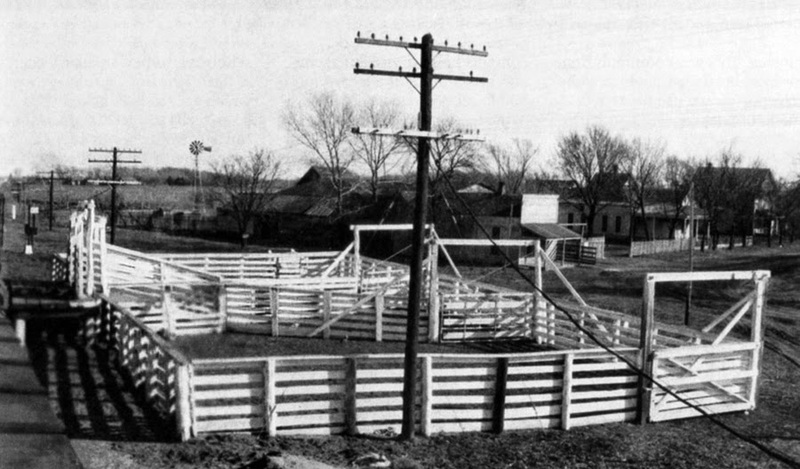 There were numerous such pens (which SP called “stock corrals”) along SP lines throughout the west. That’s what I want to model. 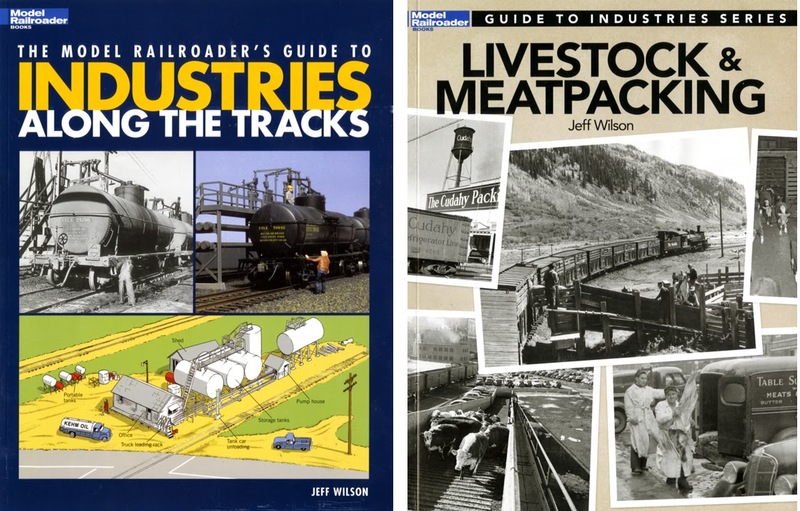 Before I get into my modeling plans, I should mention two excellent sources of information about livestock and associated industries (meat packing, etc.). Both are by Kalmbach’s Jeff Wilson. The older book, the first volume in the series, The Model Railroader’s Guide to Industries Along the Tracks (2004), covers the livestock businesses in an 11-page Chapter 6. A more recent book takes up that same subject in a book-length treatment, Livestock and Meatpacking (2013). Shown below are the covers of the two books. Incidentally, if you have the 2013 book, no need to get the earlier one for its brief treatment. The newer book is really a huge expansion of the older chapter. But if you only have the older book, you have a good summary in Chapter 6. In addition to a whole bunch of historically very interesting photos, author Wilson has also provided in the 2013 book data on stock shipping, an account of how livestock waybilling was done, and diagrams of the layout of stock pens. The latter drawings are a helpful re-publication of material in an article from Paul Chilcoine in Model Railroader for April 1983. There is an interesting Santa Fe photo, one I’ve seen elsewhere, reproduced in the 2013 Wilson book, which helpfully shows a really small stock pen, the kind of size most modelers are compelled to build for space reasons, and that applies to me, too. It had just two pens and one loading chute, and was located at Milan, Kansas. The pen appears to have been whitewashed, though most stock pens show at most the vestiges of such beautification. 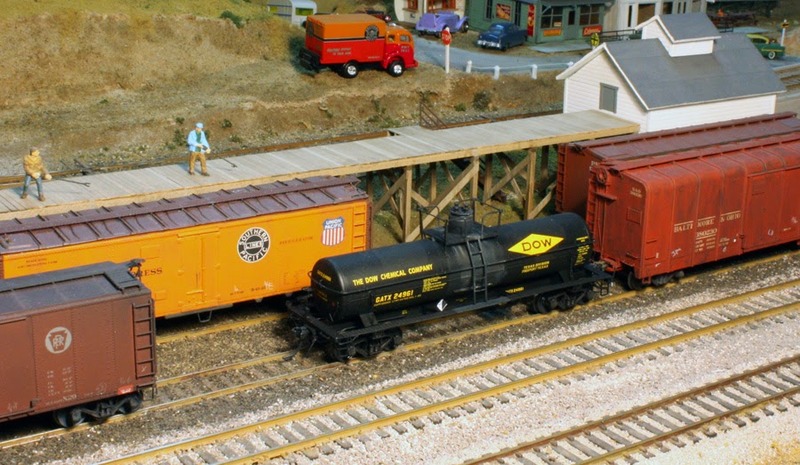 Over the years, there have been many kits for stock pens, at least in HO scale. In stripwood, Timberline had a nice one, and the Campbell Scale Models one is still available (kit no. 400). Plastic versions from A.H.M., Tyco, and Bachmann were all for rather small pens, but today Walthers has one (their number 933-3047) which is for a larger facility. Of course any of these could be built smaller, or, if two or more kits were combined, larger. Some of them err in having fences not planked on both sides, where animals would walk on both sides of a fence line, but of course this is easy to remedy. I have the remnants of an AHM stock pen, and will enlarge it as needed to fit my space. In addition to the pens, there should be an office, a shed or small barn to hold hay (both for animal feed and for bedding in stock cars), and maybe some indication of water supply. Local stockyards sometimes had scales, to weigh incoming animals, but not always, and I don’t plan to include that. The AHM kit was intended to build a two-pen arrangement. I will add a third pen of the same size (they are about 15 x 25 scale feet), smaller than most real pens (for example, 40 x 40 feet, or 25 x 40 feet). Once again, modeling leads to compression of reality! I will also add planking to the sides of the fencing in the kit where it should be double-sided. 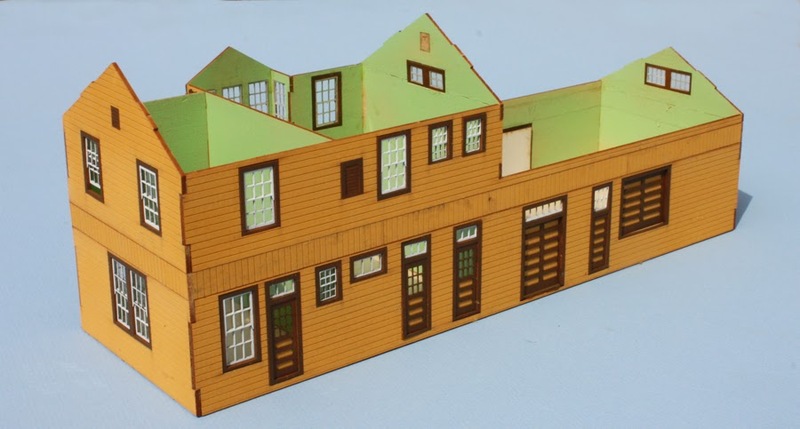 In this kit, the posts are about 2 x 6 scale inches and the horizontal boards are 2 x 8 inches, dimensions consistent with lumber sizes shown in Wilson’s book (above). 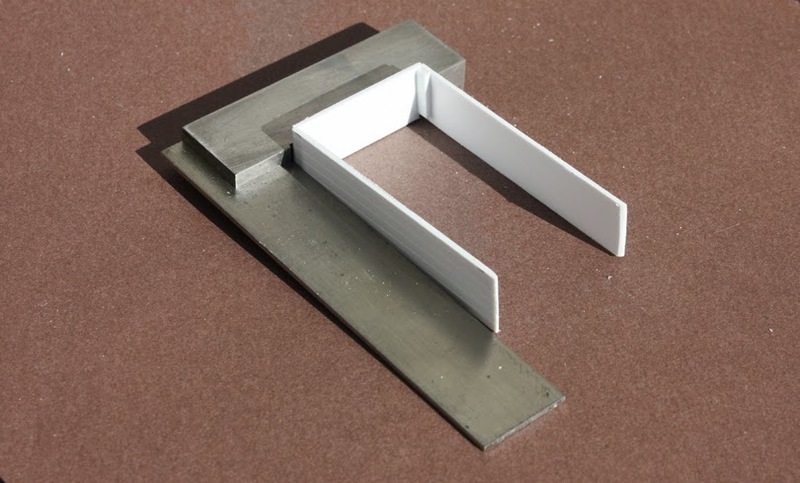 Both these sizes are available as Evergreen styrene strip, which I am using for the additional fencing. As I mentioned above, the additions will be the third pen, along with double-siding the fence elements dividing pens. I have a small building left over from another kit which can become the office. I am leaning toward building an enclosed water tank also. Obviously an important part of a rail-served stock pen is the stock cars which are operated. I have described my roster plan for stock cars in an earlier post, at: http://modelingthesp.blogspot.com/2011/02/choosing-model-car-fleet-3.html . I plan to use a mix of foreign-road and SP / T&NO stock cars, with the latter predominating. I will say more about stock cars when I show the completed pens in a future post. Several of the industries on my layout either load or unload tank cars. For petroleum products, unloading was normally done by gravity from a bottom outlet (at least in California, though I understand some states banned gravity unloading). This can be indicated on a model in several ways. A hose or hoses can be artfully draped alongside the spur track; a coiled hose can be shown on a rack; or the modeler can show just a covered box where hose connections are made, with coiled hoses assumed inside the pump house. I have done all three in different places. Here is a prototype photo of bottom unloading in progress. It was included in my column in the March 2014 issue of Model Railroad Hobbyist (back issues are always free to download at: http://model-railroad-hobbyist.com/ ). It is a Standard Oil Company photo, taken at Bayway, New Jersey, and is from the Rob Evans collection. Note that there is a loading platform above, which relates to my subject now. This post is about the situation where workmen need to connect unloading pipes or hoses at the car top (for example with pressurized gas cars, such as LPG or chlorine), or where the cargo is an ordinary liquid but is unloaded by pumping out the car through the dome (for example acids), or where a car is to be loaded through the dome’s manway (in my case, bulk wine at the winery). This next photo, a detail of one in my March 2014 MRH column, shows an unloading platform for propane, and on the ground to its right, you can see a coiled hose and a hose connection for bottom unloading. You can click on the image to enlarge. The propane tank is behind the platform, and the pump house to the right. I described the scratchbuilding of this platform in the MRH column, but just to show it clearly, here is the complete model with primer paint. Many platforms like this, which were in regular use, had stairways rather than ladders, but platforms that were only used occasionally sometimes did have ladders. I need to build two platforms, one of which is for loading tank cars at my winery at Ballard. The second is for my chemical repackaging company, which needs a more complex top unloading facility, for pressurized gas cars as well as for top-unloading cars. These two platform projects are kitbashed, or at least rearranged, from the Walthers “Oil Loading Platform” kit, their number 933-3104. I should emphasize that there is nothing profound about my modification of the Walthers kit, only that I thought it might be interesting to show ways it can be used other than the stock kit assembly. As Tony Koester says, in his excellent and inspiring book, How to Kitbash Structures (Kalmbach Books, 2012), “Do not read the label on the box.” That means, just see if the picture of the completed structure resembles, or can contribute to, what you want to build. In my case, the Walthers kit is being transformed into two platforms, one for chemical unloading, the other for wine loading. 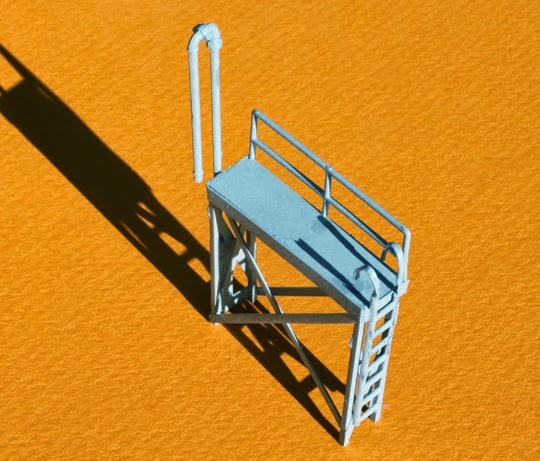 The kit’s label, “Oil Loading Platform,” might make you think it was only for that use, but it needn’t be so; neither of my models will be used that way. The kit is set up so tank cars can be loaded on both sides of the platform. But I have only a single track at both my industries, so I won’t use the double-sided feature of the Walthers platform. Moreover, the Walthers deck is molded to represent (poorly) steel grid, whereas in my modeling year of 1953, steel grid walkways were relatively new. I simply sanded off the grid, and glued some Evergreen 0.020-inch thick grooved styrene (from sheet no. 2067) on top of the Walthers deck. I then cut the deck in half to make two shorter decks. This immediately suggests a small problem, in that the kit has only three vertical supports, while building two platforms pretty clearly requires a total of four. I simply made another support, with Evergreen C-channel legs (no. 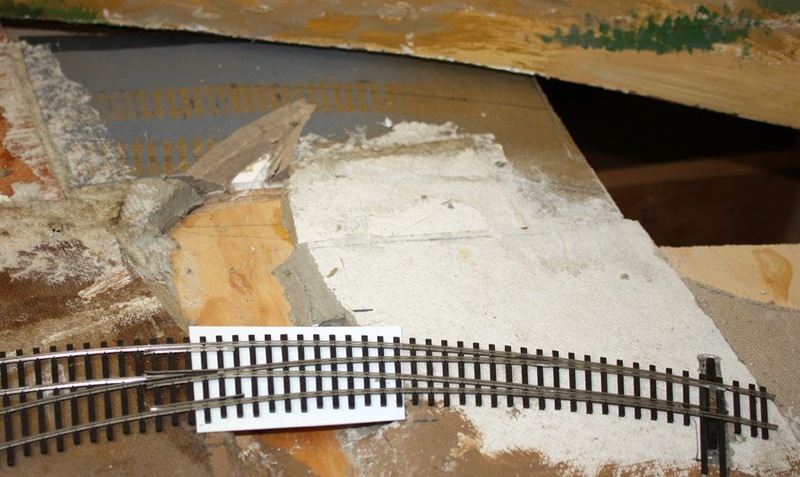 262, which is 0.080-inch channel) and HO scale 2 x 8-inch strips (Evergreen no. 8208), and assembled these to match the kit supports. Another strategy would be to support one end of one of the platforms against a building, which would avoid having to scratchbuild a support. You can see the dark gray plastic of the Walthers platforms under the white scribed styrene overlay. I included a kit support so you can see the white styrene support next to it was modeled on it. The next steps will be to start assembling the pieces, mostly using kit parts. I will show more progress on the platforms as they come along. The new issue of Model Railroad Hobbyist, for March 2015 (you can download it for free at: http://model-railroad-hobbyist.com/magazine ), contains my latest column in the magazine’s “Getting Real” series. It is essentially a second and completing segment of my discussion of “signature” freight cars for a variety of railroads. That discussion began with an MRH “Getting Real” column, published in the issue for April 2013, and like all issues of MRH, downloadable for free at the link shown above. As I stated in both columns, I define a signature freight car as one which is highly representative and characteristic of its owning railroad. This can be a unique freight car design, such as the famous Milwaukee rib-side cars, or it can be something as mundane as the 1937 AAR 40-foot box car, if the owning railroad had enough of them to make them a major part of its car fleet. In my two columns, there are indeed some cars of both kinds, and I have tried to indicate the reasons, for each railroad, for choosing the particular cars that I did. But as for choosing the railroads discussed, that was on the basis of size. This in turn implies an acceptance of the Gilbert-Nelson idea, that the visibility of any railroad’s car fleet in other parts of the country can be approximated by the proportions of its fleet size, to the entire national fleet of the United States. In that first column, in April 2013, I introduced models of signature cars for nine railroads, which were the Milwaukee, Baltimore & Ohio, Missouri Pacific, Northern Pacific, Illinois Central, Seaboard, Great Northern, Boston & Maine, and Denver & Rio Grande Western. The new column fills out the selection by including all the largest railroads, and adding a couple more small ones. The basis for these selections is the graph below. 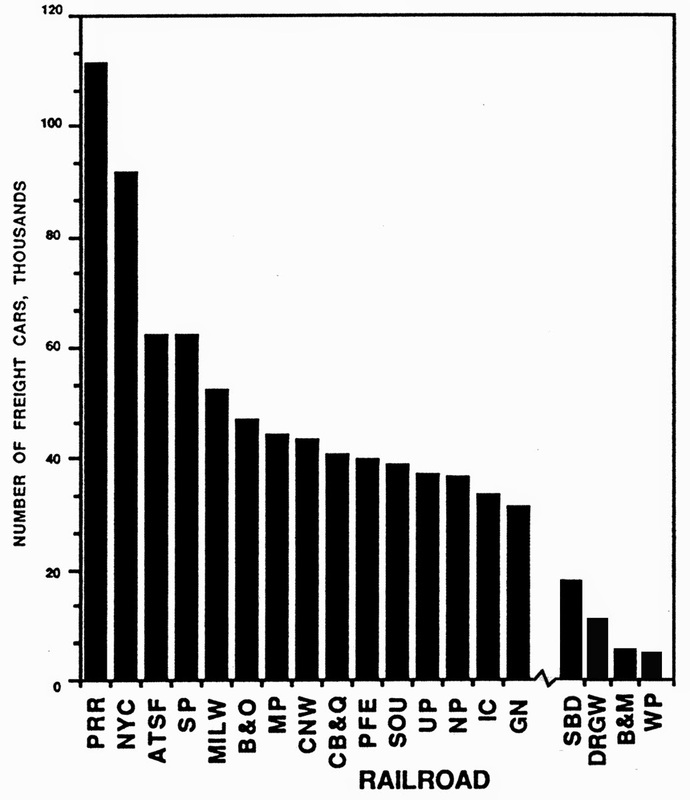 These car fleet numbers are for 1950, include all subsidiaries (such as T&NO for SP, and Pere Marquette for C&O), and have subtracted all hopper, ballast and ore cars, since those interchange far less, in general, than other car types (thinking, of course, in terms of Gilbert-Nelson). Note the break after GN: the four railroads to the right are considerably smaller. In this graph, you can see all the roads listed above, as having been covered in my first column, and all remaining railroads in the graph, ten in all, are the ones covered in the second column, for March 2015. I will give some examples. In particular, I was pleased here to include representatives of giant car fleets such as Pennsylvania and New York Central. 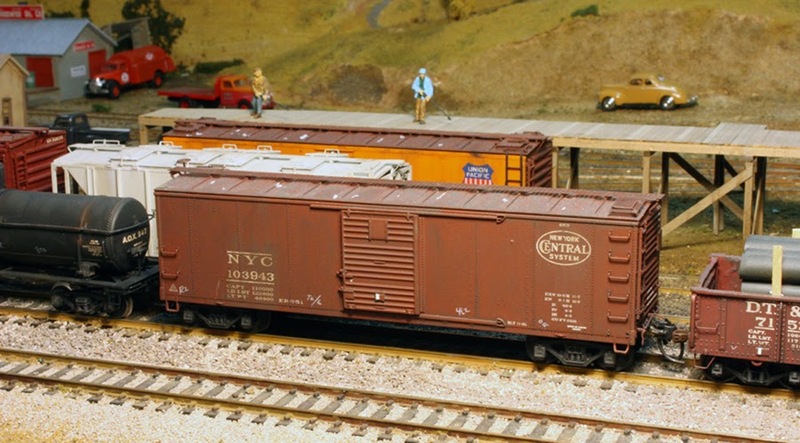 The signature box cars for each road are iconic American freight cars. Here are photos, which are different from those in the column, of my models, beginning with PRR. The X29, built in immense numbers of more than 29,000 cars, represents more cars in this single class than many railroads had in their entire car fleet. This is the Red Caboose styrene kit, weathered to a suitable degree for the 1950s and given to me by Richard Hendrickson. New York Central likewise had a huge group of signature box cars, built in the 1920s and based on a modification of the proposed (but not built) USRA steel box car. In the year I model, 1953, there were still more than 17,000 of these cars in service. Broadway Limited brought these in as ready-to-run cars. Finally, among larger roads, I will mention Southern Pacific, which I model. The immediate pre-World War II cars SP purchased, with W-corner-post ends, numbered 5244 cars in several classes. One of them was Class B-50-23, as modeled here with an Innovative Model Works kit which shows a post-1946 repainting. Much more discussion and analysis is presented in the column, which I would commend to you if you are interested in understanding the signature cars of railroads other than the one you primarily model. Doubtless on that railroad, you know far more than I do.